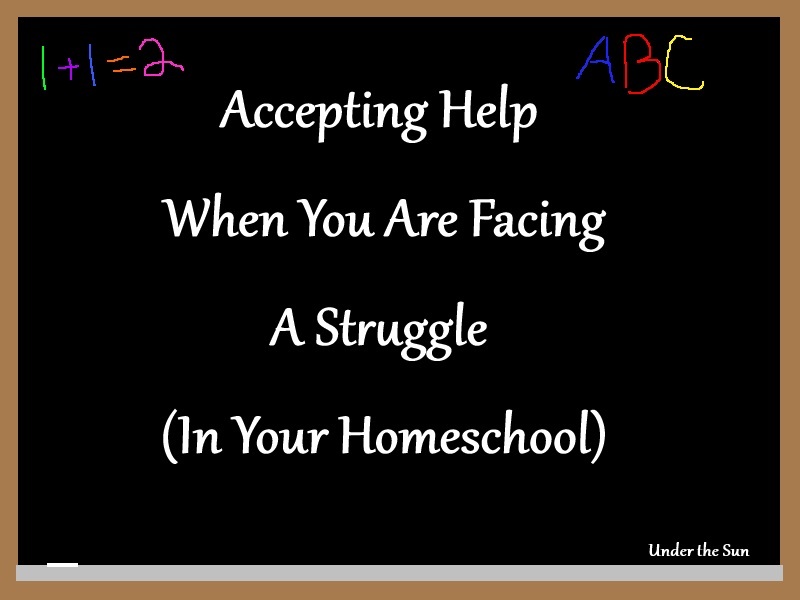 There may come a point in your homeschooling journey where you are facing a struggle that you don’t know how to handle on your own. It may be something as simple as you are not confident enough to teach the advanced math or sciences. Or you find despite all your best efforts to aid your child at home, your child has a developmental delay that you need the guidance of a physical, occupational, or speech therapist for. Coming upon a situation where you need outside help is not a bad thing. Let me tell you a short story. Right around Chloe’s second birthday (before I had even given serious thought to homeschooling,) I started to wonder if she might have a language delay. At that time I didn’t think it was anything big, but I wanted to know more about when I should be concerned with her linguistic development. 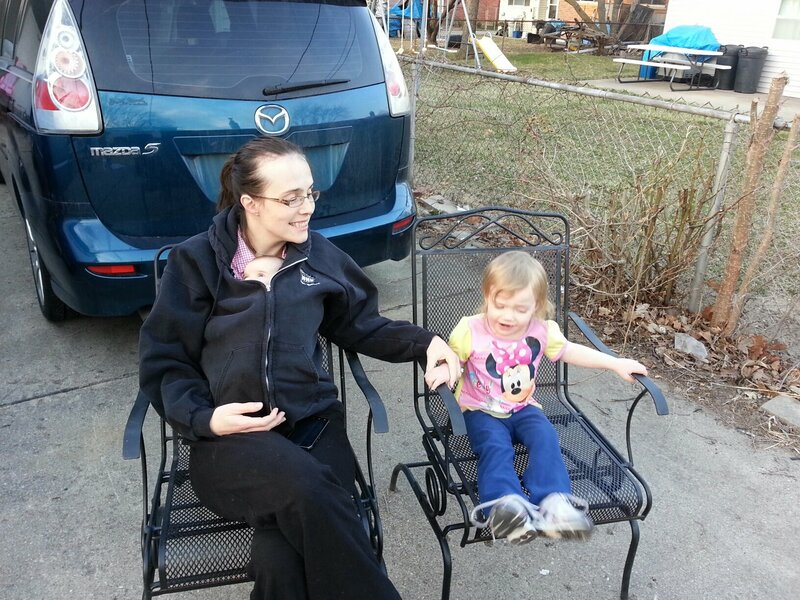 Her doctor then told me I didn’t have to even think about that until she was 2 1/2. So I ignored my immediate concerns and figured since she understood me just fine that I would let it go for now. By 2 1/2 her delay had become significantly more pronounced. Approaching her third birthday I contacted the public school around here on the advise of my mother’s neighbor, who is a public school teacher. She described to me a program called Early On, where children under 3 years of age can get assistance from the public schools, if it is determined the child has developmental delay. I went home and did a little research. I contacted the public schools where we were to get the ball rolling. The program that my mother’s neighbor referred me too. Since it was summer time, when I contacted them I had to wait to get my daughter tested until school came back in session. 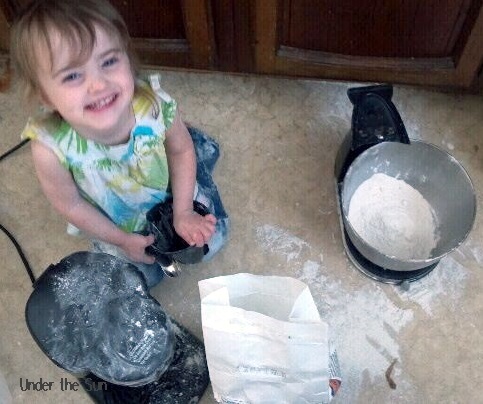 By the time they tested her she was a month from her third birthday. They agreed she had an expressive language delay, but explained she was reaching the upper age limit for the program I had inquired about over the summer. They were able to offer me a speech therapy program though. 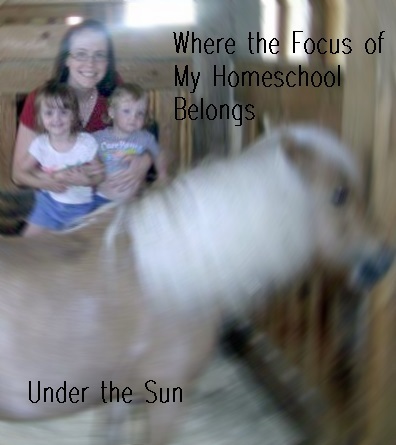 I was on cloud nine by the time I heard my first homeschooling speaker. 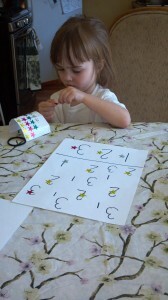 I still wasn’t seriously considering homeschooling, especially considering I had just enrolled Chloe in public school. This parent was part of a panel made up of a public school parent, a charter school parent, a private school parent, and a homeschool parent. I found the whole thing interesting. 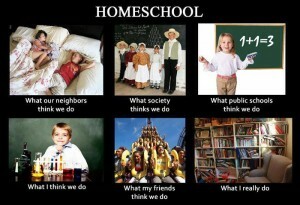 I especially found the homeschooling parent interesting. Interesting enough I spoke with her briefly after the panel was over . I found she was very encouraging until she found out I had enrolled my daughter in the public schools for speech therapy. All the interest I had developed in homeschooling over that hour quickly dwindled listening to her talk to me, or rather talk down to me. 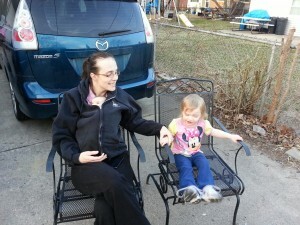 It felt as if she was pronouncing me a failure because I needed the extra help with my daughter. 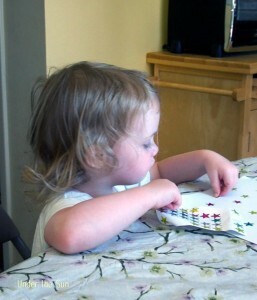 Now as you know, I have come around to homeschooling, despite my experience with that woman. The point of this story though, is there will be people out there that think you have to do this all on your own. There is no need to face a struggle and barely muddle through, or to feel you have to give up and send them to public school. Seek help. Accept help. Help can be found when you are facing a struggle, help that is unique to your situation. 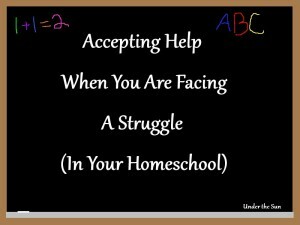 Needing help does not mean you are failing in homeschooling. All it means when you seek and accept help is that you want the best for your child. Sometimes someone other than us are the ones better suited to aid in these areas. 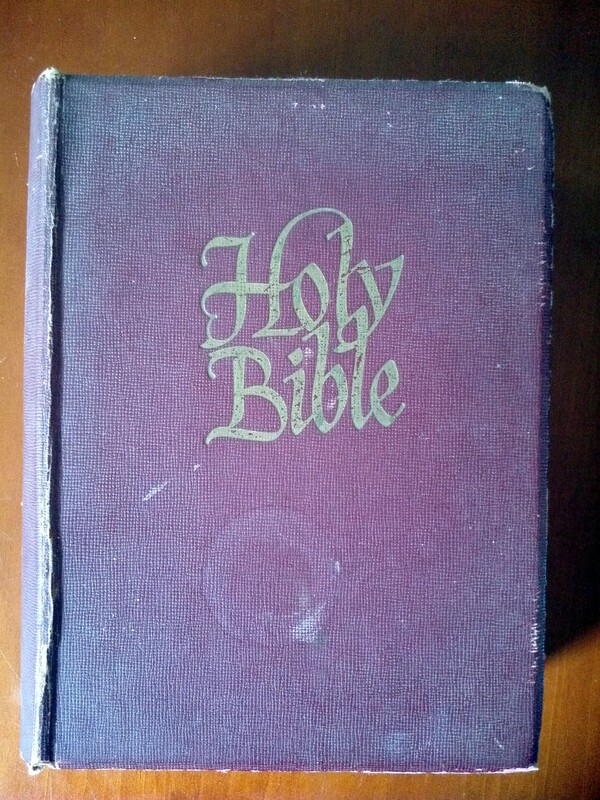 This entry was posted in Homeschool and tagged accepting help, Children, homeschool, Kids, Struggling on July 17, 2013 by Sara R.
Scrolling through my Facebook feed, this morning I noticed a friend was contemplating acting vindictively. I am actually not here to discuss that, while I don’t feel we should act in a vindictive manner, I think we all would agree we have felt those urges. Some of us have acted upon them, and others of us know how to rise above those feelings. What struck me really was in the comment section. Hiding among the encouragement, for my friend, to walk away from the negativity and for her to set healthy boundaries, was the suggestion to simply give into that side of human nature. I don’t disagree it is human nature. What I disagree with is the idea that we should simply give into it if it is natural. There is a whole generation that believes if it is natural then it must be alright to do. I would argue that emotions are just temporary, no matter how natural that it is that we have them, and our responses should not be based on the temporary. I understand the appeal; there is short-term gratification, some times it is just easier, and other times we know no other way. Instead I believe as a Christian I need to be seeking to live a life that brings me closer to my God. That life does not include room for the negativity. I also believe that as a parent that it is my responsibility to be teaching my children how to rise above temptation, and that is one of the benefits for me in homeschooling. I can show them how I am living this out in my life everyday. It is in the little things we build relationships. Prayer, prayer, and more prayer. We pray at every meal. We pray at bed time and nap time. They see me pray when I lose my temper, when I am hurting, and any time I am called to. We read bible stories together. We read from Psalms together. (I found at my children’s young age they handle the poetry better, than the long stories found in many of the other books.) We talk about what we read. They see me reading it on my own. 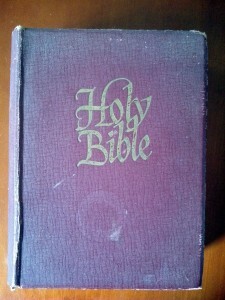 They know this is a book that is a part of our days, and not just decoration for our homes. In other words, I let them see me succeed and mess up. When I succeed I seek to show them how to do so humbly and graciously. When I have messed up and fallen short, which is often, I model apologizing, repenting, and simply trying again. John 13:1-17 Is a beautiful example of Jesus modeling behavior. When I see them displaying the character traits that I am hoping to instill upon them I praise them for their effort and hard work at it. In Titus you will see where the Bible talks of encouraging one another in Godly behavior. 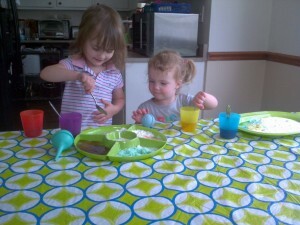 Homeschooling allows my family the opportunity to do this each and everyday throughout the days. 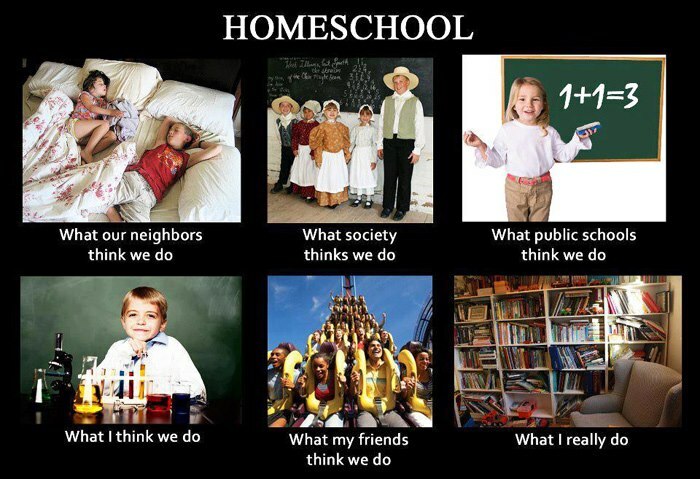 I know homeschooling is not the answer for every family, but it is for mine. I can best model this behavior when they see me consistently doing this. This entry was posted in Children, Homeschool and tagged Bible, Children, God, homeschool, Jesus, Kids, Life, modeling, prayer, school on July 3, 2013 by Sara R.
Chloe and Paige finding out what happens when you mix vinegar and baking soda. 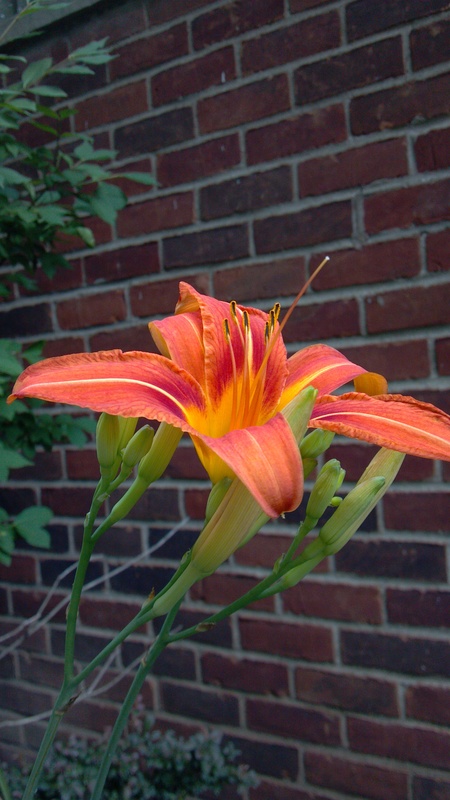 I am relatively new to the world of homeschooling, and I invite you to follow me on this journey. Come discover pitfalls as I do, and celebrate milestones with me as we reach them. I will not only talk specifics of our journey, but try to provide encouragement for your journey, whether or not you homeschool, because every parent is a teacher for their child. I want to note that I am not against the public schools or any sort of school for that matter. Rusty and I have made the choice to homeschool our girls and that is our choice. It is right for us, that does not mean it is the right choice for everyone. 1. It provides me with the best opportunities for discipleship. 2. I can customize lessons to work with them at the level they are at, for each subject. 5. More flexibility on when our family can take vacations. 6. They get to spend their days socializing with people of all ages and backgrounds. 7. I will be able to allow them to help direct the course of their education. 10. I feel God calling me to do this! 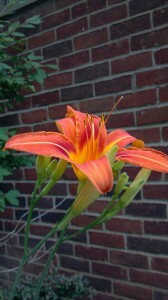 This entry was posted in Homeschool and tagged Children, homeschool, Kids, learning, school on June 19, 2013 by Sara R.